It’s still pretty darn hot- evidently the desert isn’t going to let go so quickly. Now the heat is mixed with a kind of high altitude dilation. 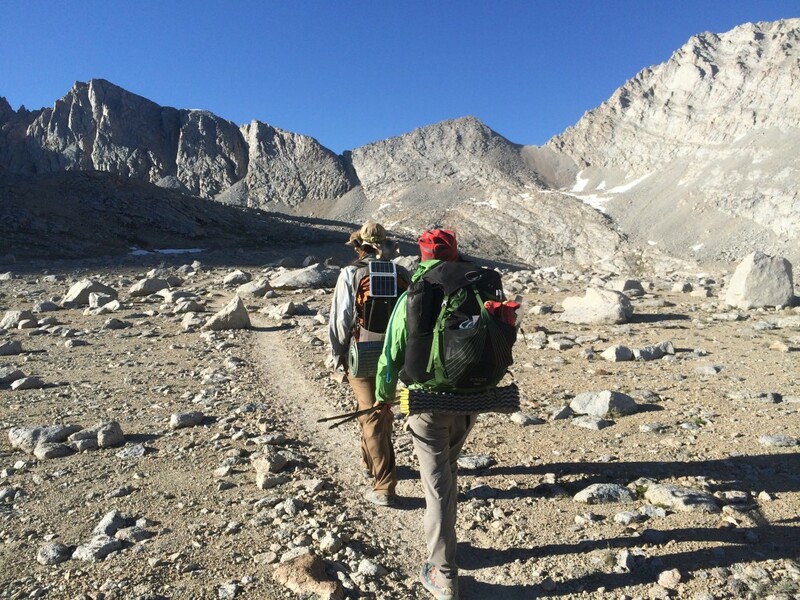 The miles are taking longer to cover than anticipated and, as we head for Kearsarge Pass – still a couple of days away, we realize we don’t have enough food. We’re hungry. It takes over all of our conversations. We give each other detailed descriptions of past dinners, discuss recipes, and find ourselves pursued by the “cheeseburger bird” whose song is distinctly “cheeeeeese bur-ger”. Unlike the desert where I encountered only a handful of day and section hikers, I’m now sharing the trail with LOTS of John Muir Trail and day hikers. One of the great things about them is that they carry too much food. This creates a nice, symbiotic relationship between the PCTers and the JMTers. We are more than happy to take the extra weight off their backs and they seem genuinely happy to help us out and lighten their load. Our “yogi’ing” liberates bagels, summer sausages, soup, bacon (! ), and Clif Bars. We happily devour everything. Thank you JMTers!! Newlywed JMTers and bearers of two extra sausages! During one yogi’ing incident another kind of hiker shows up: a Super Hiker. THE uber-hiker herself, Anish. 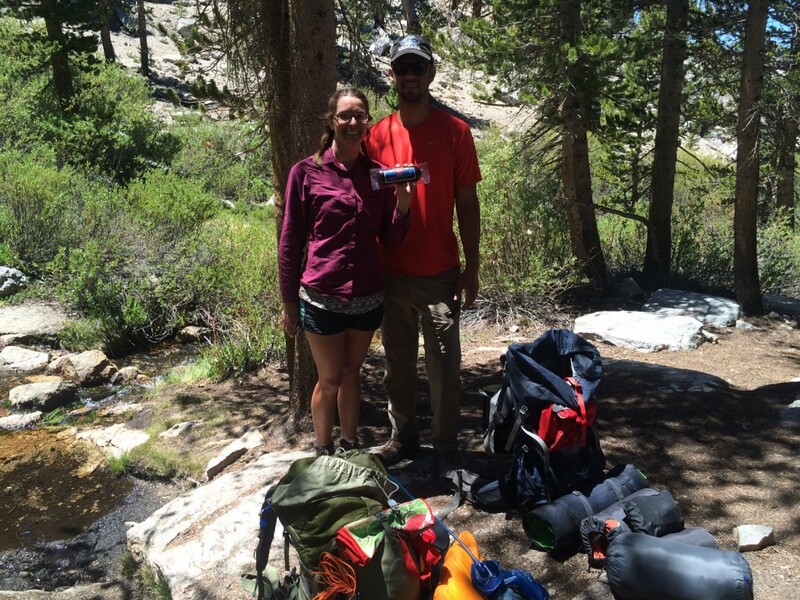 Anish holds the fastest known self-supported time for completing the PCT – 60 days! Right before sunset, we approach Forester Pass. At 13,098 feet it’s almost as tall as Whitney. Luckily, I’m more acclimated to the altitude. I’m still pretty slow, but feeling good. 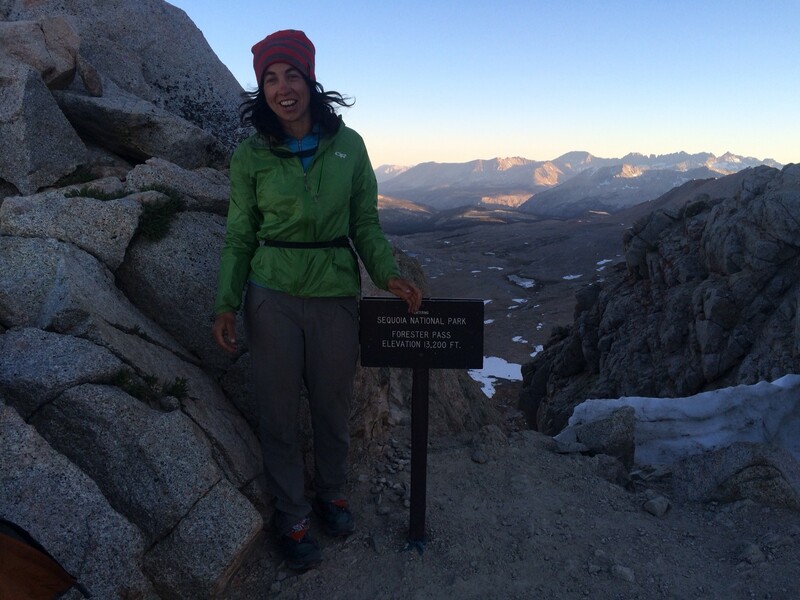 I hike past frozen glacial lakes and up the switchbacks. The light is a golden pink orange. It permeates me; strengthens me. One of the interesting things about passes is that you don’t really know what you’re going to find on the other side. This time it’s snow and loose rock. 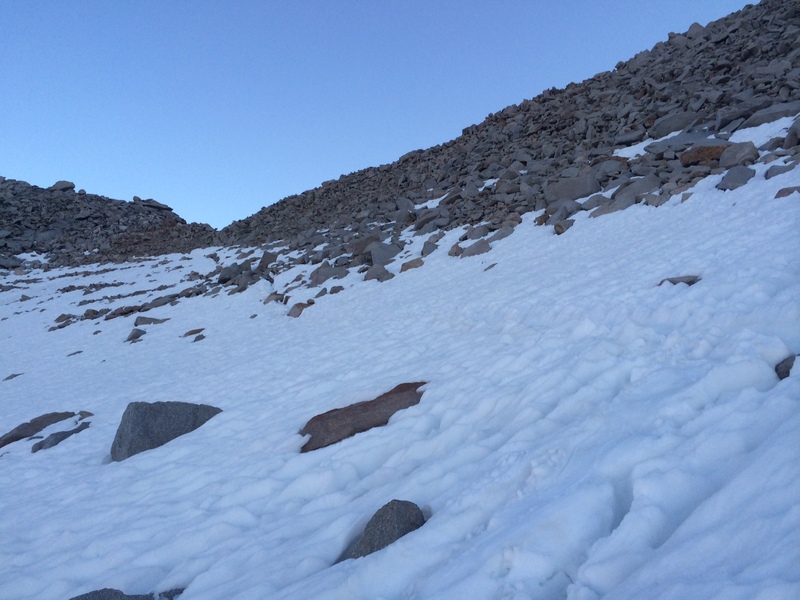 Glissading doesn’t seem like a possibility – the snow is too mushy, so we slowly pick our way down. The sun sets and we’re navigating the rocks by headlamp. I couldn’t have imagined doing this before I began hiking the PCT. Now, you know, it’s just something I do. It’s 9:30pm by the time 11, Copper, Microwave, Namaste and I near a water source and a flat spot. There is a lone tree surrounded by an ad-hoc rock wind block. We pitch our tents, but then end up bringing our pads under the tree. I play DJ using my phone and Namaste’s speakers. We’re cold, hungry, and exhausted, but also content, fulfilled, and enjoying ourselves immensely in our high altitude fort. 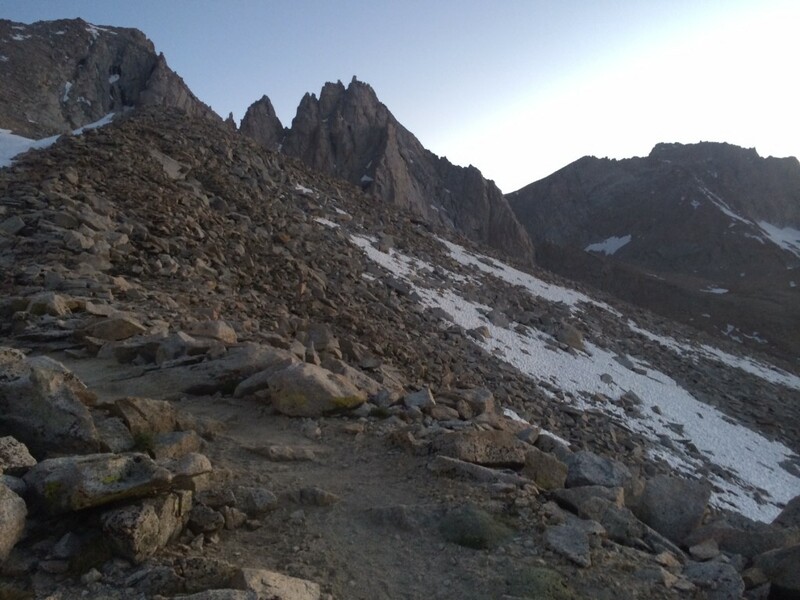 This entry was posted in Transmissions and tagged 11, altitude, Anish, cooper, food, Forester Pass, heat, john muir trail, microwave, namaste, super hiker. Bookmark the permalink.